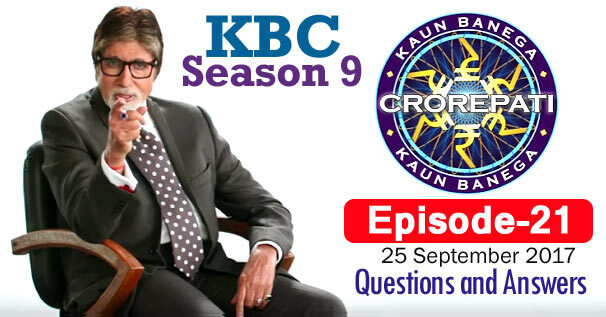 KBC Season 9 Episode 21 Questions and Answers: The twenty-one episode of Season 9 of Kaun Banega Crorepati (KBC) was telecast on 25th September 2017. In which Amitabh Bachchan had asked contestants 14 questions of General Knowledge. The correct answer to all the questions is given below each question. By reading these questions, you can prepare yourself for the next KBC Season 10 of Kaun Banega Crorepati. Because by reading these questions, you will understand what kind of questions asks Amitabh Bachchan in KBC. These all general knowledge questions will be helpful to for you various Competitive Examinations and Interviews besides KBC. Remember, the answer to some question may be in accordance with that time, while the answer to those question may differ according to the present time. 1. Starting with the first, arrange these cities in the order in which they would see the sunrise on a single date. 2. With reference to attire, what is Chooridar a type of ? 3. Complete this line from a song in the film 'Jagga Jasoos' "Yahi umar hai kar le ______ "
4. Which of these is also a term often used with reference to the internet ? 5. Which of these sports does not have 11 players in each team ? 6. Which of these organs is a part of the human digestive system ? 7. Identify this woman leader who is talking of her 'ghar waapsi' ? 8. Which of the following pairs of countries do not share a border ? 9. Which Hindi films poster carries this caption: "3 shots that shocked the nation" ? 10. Who votes to elect the Rajya Sabha Menbers ? 11. Which of these women started her career in ICICI bank in 1984 and went on to become its MD and CEO in 2009 ? 12. Who among these is the 'Shishya' of 2016 Dronacharya awardee Bishweshwar Nandi ? 13. Which solider was awarded the Param Vir Chakra after he was martyred during a UN Peacekeeping mission ? 14. Arrange these former prime ministers in decreasing order of the number of years they served in office.